I have found that I have an incredible superpower – which I share with a LOT of people. The ability to talk myself out of pretty much anything in a single bound. This power is big, loud and always present. If I believed everything I thought I would be 400 pounds and have a house full of cats. Everyone has it in them. The trick is activating this kryptonite. And it begins. Then you strengthen it by talking back to that superpower and completely destroy it by taking action. Shut up. I am too young to feel this old. I’ll get back to you after I’m done on the treadmill. Shut up. I love having energy and sleeping well. You are going to have to wait while I finish making my healthy, fabulous dinner. Shut up. I love taking risks. Yes, I have been hurt but man, I have also had some great times and better ones ahead. Personally, I love my kryptonite. In the last month it helped me kick a major pop habit, poor eating habits and a very lazy lifestyle. Drinking water with a fresh lemon squeezed in it in the morning while on the treadmill, followed by small meals of fresh veggies, fruit and a protein centered dinner, mediating, being open, trying new things and putting myself out there has resulting in having more energy than I have in years, feeling younger than ever, a healthy glow, a fantastic attitude, some new opportunities and waking up feeling grateful for the adventure of a new day. And it has only been a month. That kryptonite is some pretty powerful stuff. I still have a ways to go yet, there are still some habits I haven’t wanted to kick yet and some challenges that I am still pecking at one day at a time, but it I’ve just begun. And it all began with two little words: shut up. 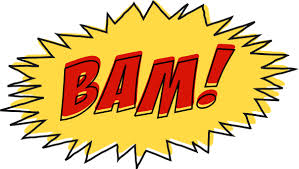 One bam, power or boom at a time – shut up. With each defeat of the superpower the kryptonite gets stronger. Where is your superpower kicking in today? What are you thinking that you shouldn’t believe? What do you really want? Are you ready to take that first step? A new job, a promotion, to ask that girl out, to clean up that extra bedroom, to start taking care of yourself, to be a better friend, to start a new hobby, to make sure those you love know you love them? Then make today the day that you say shut up.